If you own more than 2 handguns then handgun hangers are a must have gun safe accessory. Handgun hangers are a convenient, simple way to store a sidearm. Not only is the concept and design simple, handgun hangers make it possible to retrieve a sidearm quickly and put it to use. Unlike a hanger that loops around a clothes rod, a handgun hanger is designed to slide over the lip of a shelf. Little more than a flattened, elongated "5" shaped piece of steel, a handgun hanger is designed to slide into the barrel of a firearm, then the top of the 5 is slid over a shelf. Particularly for those people with children in their home, firearms that are not locked up can cause a person extreme anxiety, not to mention pose a serious threat to safety. However, trying to fit several firearms in a gun safe by simply placing them on the floor can end up meaning a firearm owner must pile their sidearms on top of one another. One of the reasons handgun hangers have become so popular is because they can greatly increase the capacity of a gun safe. Any gun safe that has an ammunition shelf inside it can accommodate a handgun hanger. 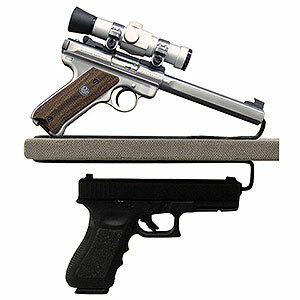 Additionally, the teeth between the notches of the wooden or metal framing designed to keep rifles upright can also serve as a mounting bracket for a handgun hanger. Having become extremely popular for both their versatility and convenience, handgun hangers can be found at most sporting goods stores, on the internet, even on eBay and Amazon. But, for those people that would prefer to make their own handgun hangers -- as the concept is so simple -- it is easy to do with a rebar or sheet metal bender. In reality, a person fan outfit themselves with a series of handgun hangers merely with a pair of pliers and some stiff metal rod.